choose a well known trusted eco brand, like Seventh Generation (their dryer sheets are non-toxic in that they are unbleached, chlorine-free, use plant-based softening agents, and are not artificially fragrance. Unlike most companies they actually disclose all of the ingredients in their products). dryer balls, quite effective in reducing static. If your washer allows for this, add a 1/2 cup of baking soda to the water in your washing machine before adding your clothes. 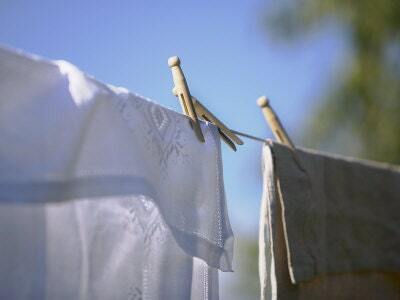 Let it dissolve prior to adding your clothes, the baking soda with naturally make your clothes soft. REMEMBER some cleaners may advertise that they are "environmentally sound" but will fail to provide a full list of ingredients. In looking for products, make sure you can read the list of ingredients. Some products are marketed as non-toxic and natural, but do not list the natural ingredients. Remember, the manufacturer that gives you the most information about its product is usually the manufacturer you can trust. At the end of the day if you really want to make sure your laundry is safe and non-toxic the best thing is to do it yourself. No hidden chemicals, no chemicals that will be found to be hazardous in 5 years to worry about. Making your own products seems like a huge hassle ( I cant even say I always do it) but there are some REALLY easy and effective ‘recipes’ that can help you clean your clothes... with products you already have in your kitchen! hey! we use seventh generation laundry detergent and it works pretty well but I have a hard time getting out oil stains out of nico's shirts (mostly food/olive oil stains...) do you think the borax would work? have you had this problem? thanks! Found a solution for you! Try treating the oil stains with your dish washing detergent. Then wash as usual. It is the best thing for oil stains!! Obviously will work better with fresh oil stains. I used Seventh Generation dishwashing detergent with Matteo's shirts (2 were stained with oil stains) and worked PERFECT ... ! I have also traditionally used Sevent generation and had the same problem. This last load I tried the borax and did see s difference (but mostly with smelly/sweaty gym clothes that SG wasnt cleaning very well). The old oil stains from Matteo's shirts are still there.. but this might just be because they are old and set? I tried submerging matteos stains in vinegar and that also helped a lot..... but have not tried this on oil (tomorrow will finish a post on "recipe for green cleaning" want to try out 1-2 more before I post them!! !